This album was released 1958 under the famous RCA Victor Living Stereo label. 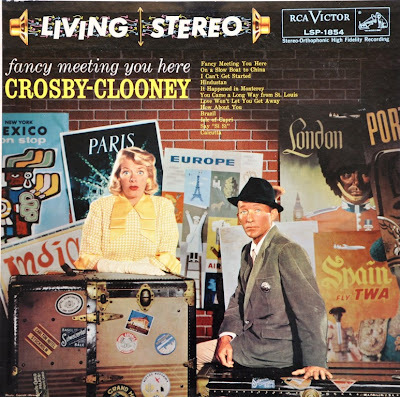 Rosemary Clooney and Bing Crosby perform a selection of duets, arranged by Billy May. 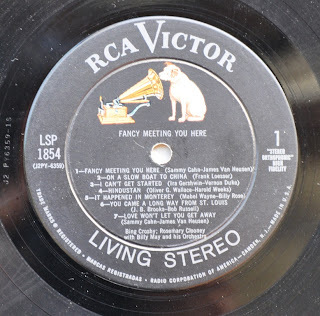 As most of the Living Stereo records this one is of exceptional recording quality. It is a studio album. Obviously very little processing has been done to the recording. The vocals are very natural and warm sounding. In terms of music this album is not meant to be taken too serious. It is entertaining. In each song the artists build up a dialogue and each track tells a funny little story. It could be categorized as easy listening. 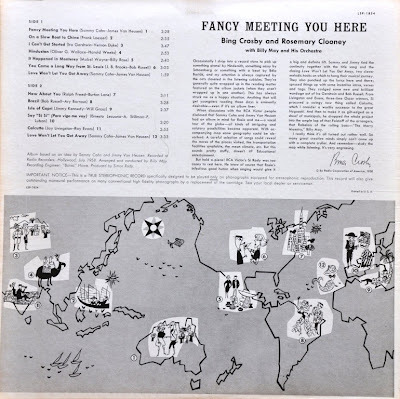 It is a fun album, I like to pull it out occasionally and play it all the way through. 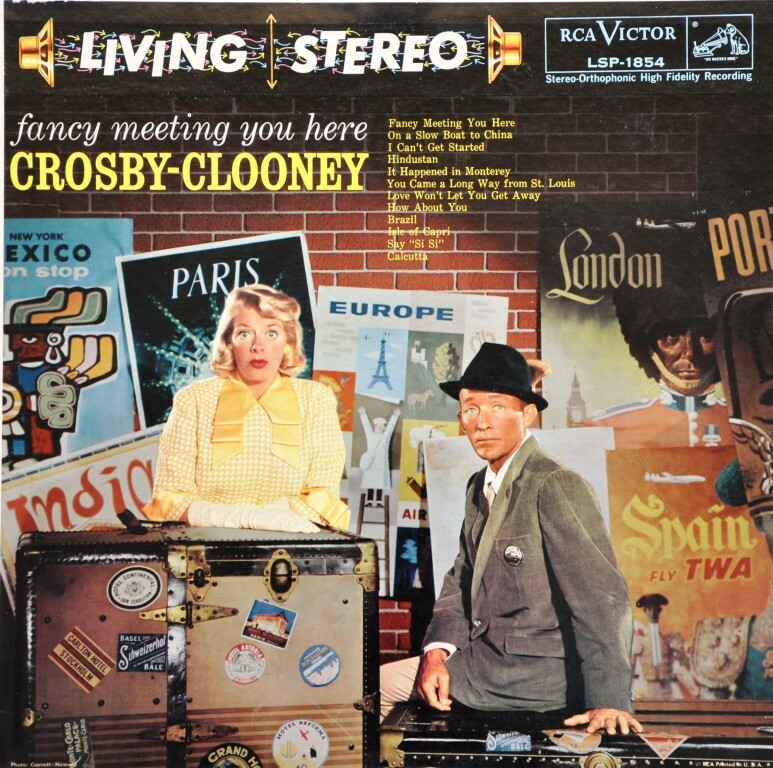 This record is not as well know as many other Living Stereo albums like the classical series with Fritz Reiner, or the famous Live at Carnegie Hall recordings with Harry Belafonte. 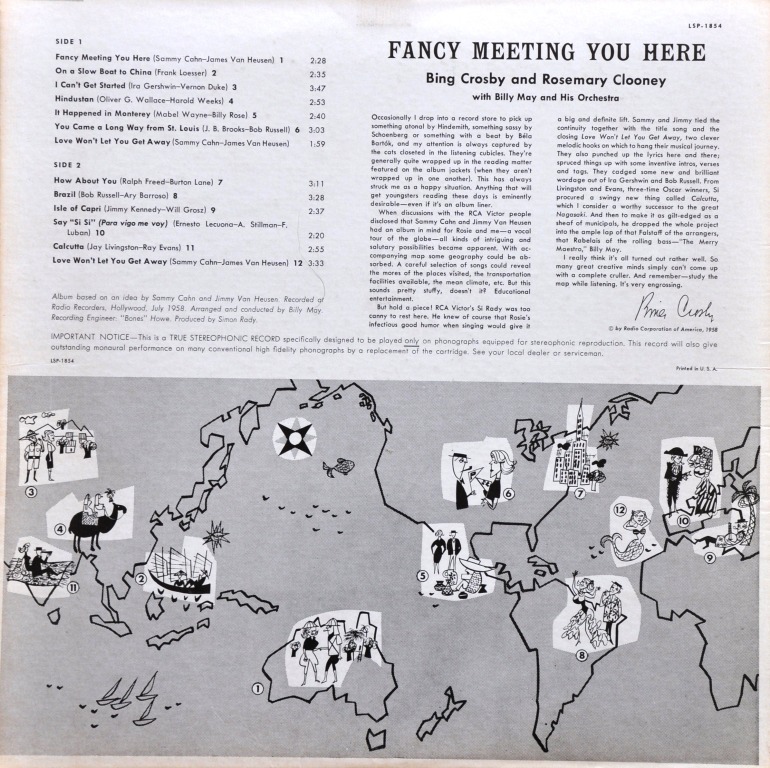 Hence it can be found at the ususal sources for old records at reasonable prices. He might make this poster available to everyone. Keep an eye on his website for this. His idea inspired me to start a series of articles about tube box artwork. 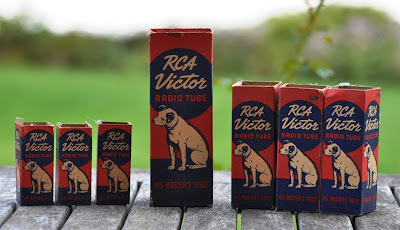 So this is the first one about tube boxes from RCA, who was probably the largest manufacturer of vacuum tubes. 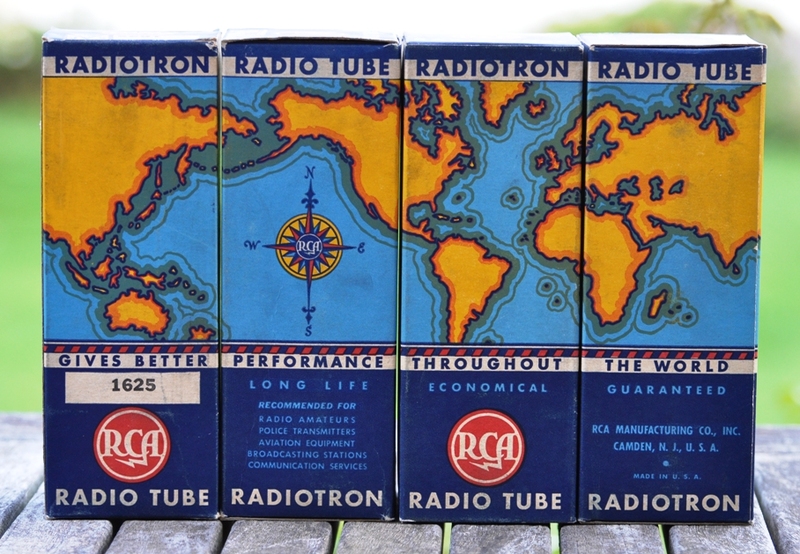 Starting from the left with tiny boxes, containing acorn and 8 pin noval base tubes to larger tubes with UX4 and Jumbo 4 pin bases like 866A and 8000 on the right. Stay tuned for upcoming articles in this new series of posts about tube box art! This is a photo taken from a 866A in operation. 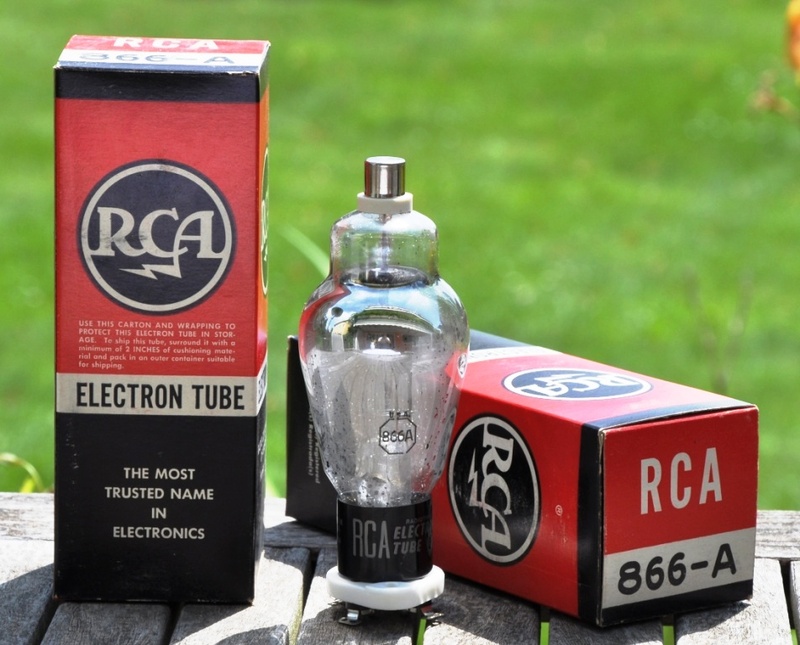 As the name implies, the tube contains mercury, which get's vaporized during warm up of the tube. When current flows, ionized mercury creates this eerie blue light which is quite intensive. 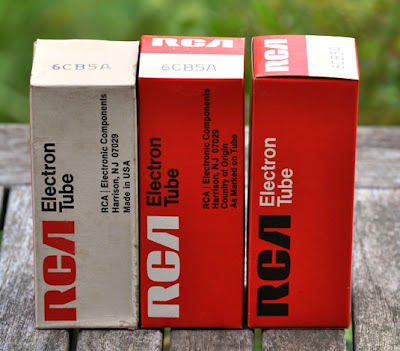 But nothing comes for free, there is a big disadvantage of these tubes: mercury is very toxic and these rectifiers contain lots of it. 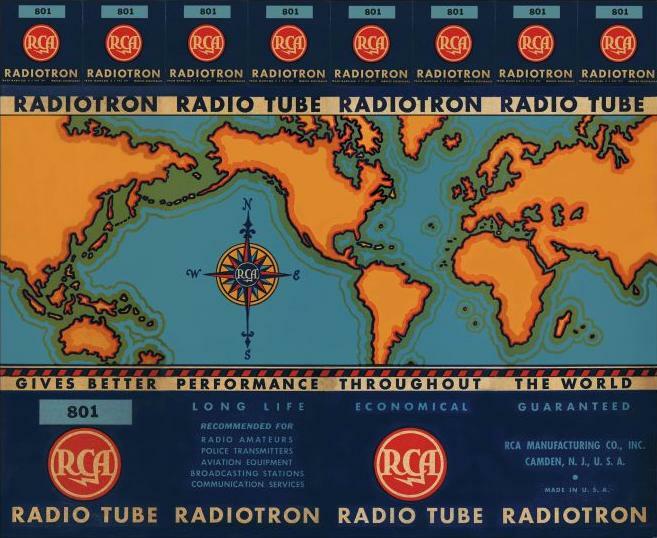 This article should not be understood as an encouragement to use such tubes. Do so at your own risk. These need to be handled very carefully and all necessary precautions need to be applied to avoid breaking of the glass. 866As have been manufactured by many suppliers. Many are still available in NOS quality. 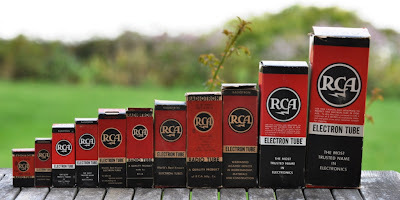 Probably the most from the famous company RCA. 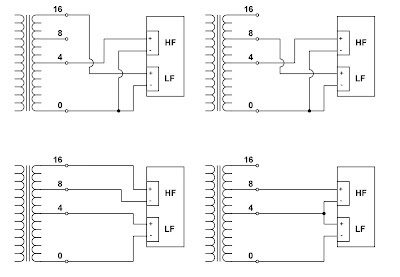 The 866A has more disadvantages over conventional rectifiers. They are single diodes. This means for the classic full wave rectifier scheme 2 of them are needed. A bridge requires even 4. 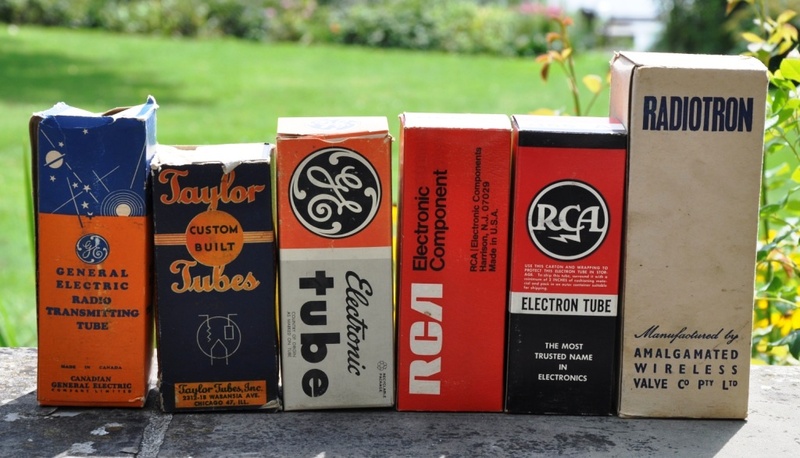 The 866A has some hefty filament requirements: 2.5V, 5A for each tube. But therefore it can supply a lot of current. 250mA average per tube which translates to 500mA DC from a pair of them in a full wave rectifier. At lower voltages (peak inverse voltage below 2500V) this value can even be doubled. 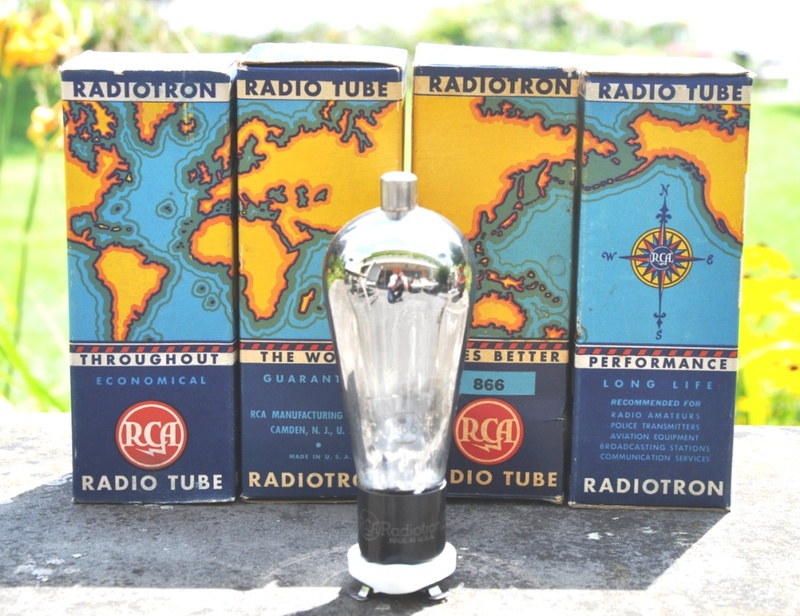 It has the UX4 base like most of the directly heated triodes. Only 2 of the 4 pins are used. The filament is brought out to pins 1 and 4, the two other pins are not used. The plate connection is brought out to a medium size cap at the top. Besides the care which is necessary to avoid the risk of breakage, the operation is also a bit tricky. The filaments must be warmed up for 30-60 seconds before the plate voltage is applied. This is necessary to ensure that the mercury is vaporized. 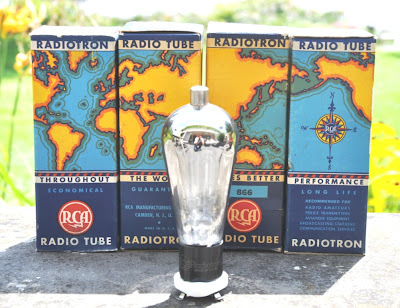 Otherwise small drops of mercury could create an internal short and arc overs which would damage the tube. When a mercury vapour tube is used the first time, or after it has been transported, it needs an initial warm up time of 30 minutes without plate voltage. After that, and if the tube remains in it's socket in vertical position with the base down (which is the only way it is allowed to be operated in) 30-60 seconds warm up for each consecutive turn on cycle are sufficient. A complete datasheet can be found here. I already wrote about an amp with a PSU using 866As. Details can be found in the post about a 6CB5A amp with 866A rectifiers. This article also explains a possible method to provide a delayed high voltage to ensure proper warm up time. 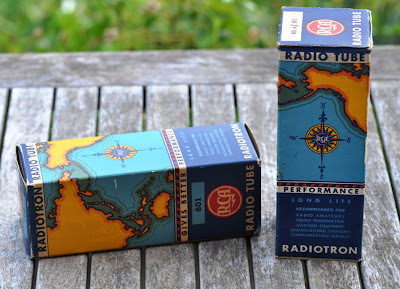 A fascinating tube! 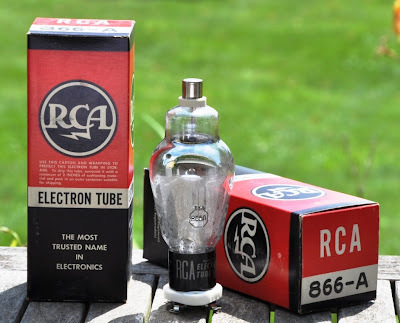 If you want to avoid the mercury but would like to have the same looks (except the blue glow) there is a near equivalent vacuum rectifier, the 836, which will be covered in a future tube of the month article. 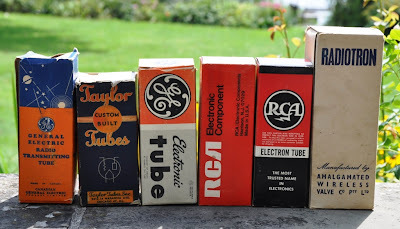 Many tube amplifers have several output taps for various speaker impedances. Typically 4 and 8 Ohms sometimes also 16 Ohms. There is a lot of confusion about which is the right tap to use. With this article I try to shed a bit of light onto this subject. There is no technical standard which defines the parameters that would qualify an output as 4 or 8 Ohm. The difference between the two is the output impedance and matching to the output stage. 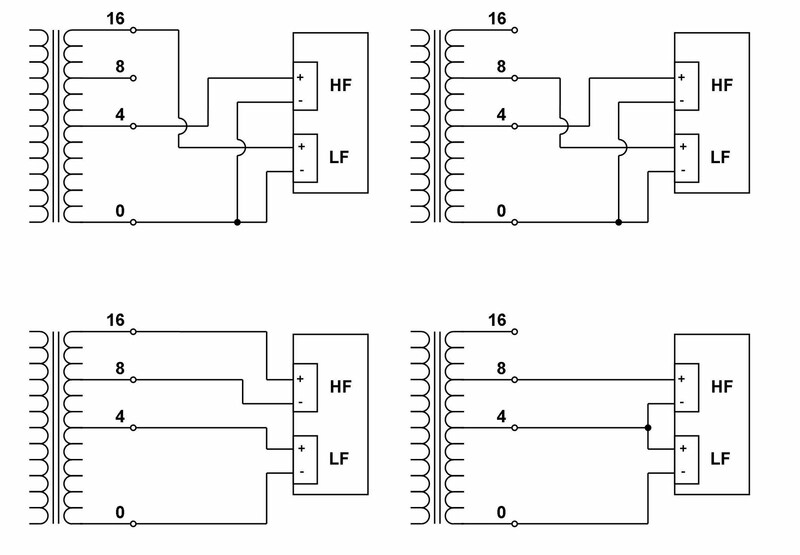 Different amplifier topologies and philosophies will yield very different output impedances though. On the 8 Ohm output for example the output impedance can be anywhere between 1 and 4 Ohm for sensible designs. Even outside these limits. For the 4 Ohm tap it will be between 0.5 and 2 Ohms. As you can see there is some overlap in these ranges. 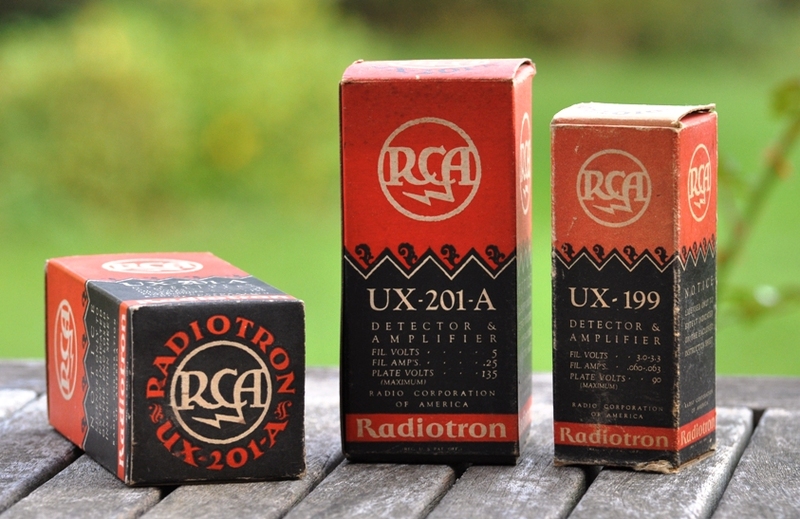 So what one amplifier designer would label as a 4 Ohm output, another one would find suitable for 8 Ohm speakers only. So this can be understood more as a recommendation, not a hard rule which terminal is to be used with which speaker. Then look at the impedance of a typical loudspeaker. The nominal speaker impedance is only a rough approximation. The impedance typically varies widely over the frequency band. A 8 Ohm speaker for example might have an impedance close to 8 Ohm somewhere in the midband. In the bass region you will typically see resonance peaks at which the impedance can rise to 20-30 Ohms or even more. In the midband and treble there can be dips significantly below 8 Ohms. Dips to 5-6 Ohms are not uncommon. Only few speaker designers linearize the impedance. Again there are no standards which define how the nominal speaker impedance is derived from the impedance curve. So again this number is widely subject to interpretation and different speaker designers will declare different nominal impedances. Due to these two uncertainties in the impedance numbers, there is no need to slavishly connect 8 Ohm speakers to the 8 Ohm tap only. Experimenting makes sense. Connect your speakers to the tap which sounds best to you. Most often hooking a 8 Ohm speaker to the 4 Ohm tap can yield some improvement. Due to the lower output impedance of this tap, the impedance variation of the speaker will have less impact on the frequency response as with the higher output impedance, the latter can actually cause some coloration. The lower output impedance will also mean more 'control' of the amp over the speaker (better damping factor). However some speakers actually sound better with a smaller damping factor. The disadvantage of such mismatching will be that the maximum possible power output of the amp gets a bit reduced. But this is negligible in most cases. 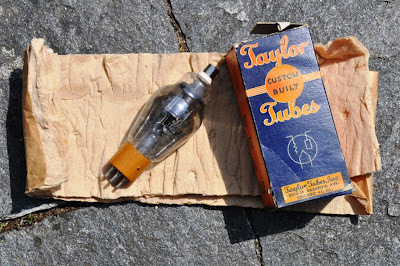 If you have a speaker with a bi-wiring terminal, or better yet, if you build your own speakers and have full control over the crossover, there are more ways to experiment with output taps. For transformers, the relationship between winding and impedance ratio follows a square law. Besides impedances the transformer also transforms voltage and current. 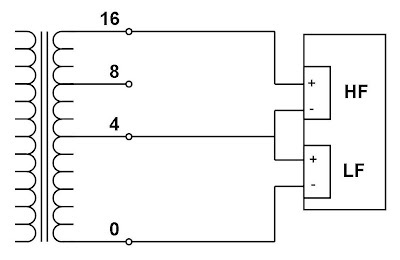 The ratios of voltage and current correspond linearily to the winding ratio. What does this mean? At a tapped secondary, the voltage at the midpoint (center tap) will be half the voltage which is seen across the entire secondary. The reflected impedance however will be only one fourth. This means that in case you have 4, 8 and 16 Ohm output taps, the 4 Ohm tap is actually the center tap of the secondary winding of the output transformer. 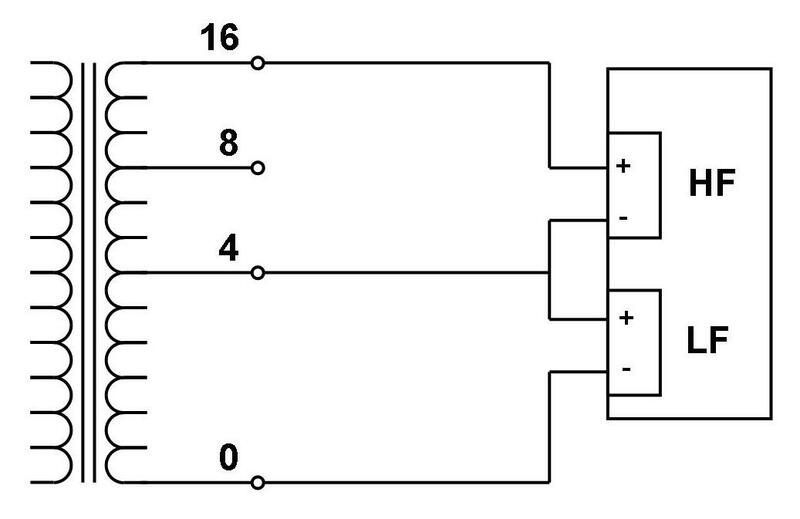 There is the same output impedance, output voltage and current across 0-4 and 4-16. Now if you have a speaker with separate terminals for low frequency and high frequency, you can utilize the full winding, even if the speaker is not rated 16 Ohms. 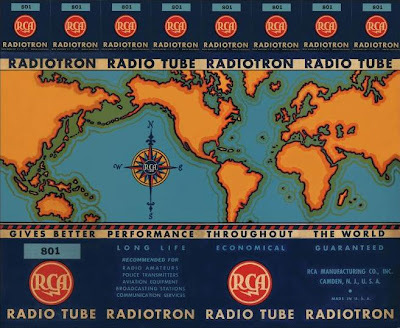 For this to work properly, low and high frequency sections need to be completely isolated. This can be checked with a Ohm meter. There should be an open between both ground terminals. Now you can connect the low frequency section between 0 and 4 Ohm taps and the high frequency section between 4 and 16 Ohm. Polarity needs to be observed. See the illustration below, how this looks like. No more unused parts of the output winding, dangling in the air! You can even use the taps to attenuate the high frequency part if necessary. The output voltage at the 8 Ohm tap is about 3dB above the output voltage on the 4 Ohm tap. This is neglecting load and output impedance, depending on the actual output impedance and speaker impedance the difference will be more like 2dB or less. Calculation or measurement is necessary to get the exact difference. In most speakers the woofer has a lower efficiency compared to the rest. So tweeter and/or midrange need to be attenuated which is usually done by a resistor divider network. With a multi tapped output transformer this adaption of the levels can probably be done without resistors, if in a given system a certain combination gives the right attenuation. The two alternatives in the first row provide 6dB and 3dB raw voltage difference (HF section attenuated). With real life impedances probably more like 4 and 2 dB. In the two examples in the bottom part, HF is attenuated by about 4.5 and 7,5dB (unloaded). So there are quite a few possibilities to adjust the level of the HF part through this technique. This leaves quite a lot of room for experimentation and exploitation of all the transformer taps which might otherwise be unused. The sonic result of this technique heavily depends on the amplifier, transformer and speaker used. Keep in mind that this is playing with mismatching. In some configurations it might not work well. Also the full output power of the amplifier will not be achieved with this. If the system has enough headroom it is worth playing with this though. In addition to purposely mismatching parts of the speaker to the amp to achieve the required attenuation, this technique can also be used to achieve correct matching, when woofer and tweeter have different impedances. For example if a 8 Ohm woofer and 4 Ohm tweeter are combined in a speaker, both can be hooked up to appropriate parts of the secondary winding, through their respective crossovers. If 4 Ohm woofers are used with 8 Ohm tweeters, the tweeter impedance can be adapted to the 4 Ohm with a parallel resistor. Since tweeters are typically more efficient, this does not hurt. The other way around it is more difficult, you would not want to bring a 8 Ohm woofer impedance down with parallel networks to match a 4 ohm tweeter. Creative usage of output taps could make this more easy.